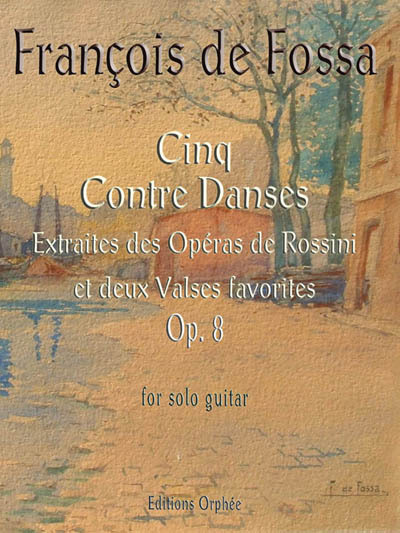 The seven short pieces in this work for solo guitar are arrangements of abstracts from operas by Rossini. However, with the exception of the last piece, these pieces cannot be identified as originating in any of the operas by Rossini. They may have been composed by de Fossa himself, or he may have taken them from one or more unidentified composers. The only piece in this collection that can be safely identified as coming from a Rossini opera is a duet aria from the first act, third scene of The Barber of Seville, where Figaro explains to Count Almaviva where he has his barber shop and what he can see in the shop window. Compositions by Rossini have been arranged by many guitarist composers. The Barber of Seville has been named “the greatest of all operas” and it is understandable that others have made versions for use at home and the concert stage. The original key is G but this instrumental guitar version is in A.